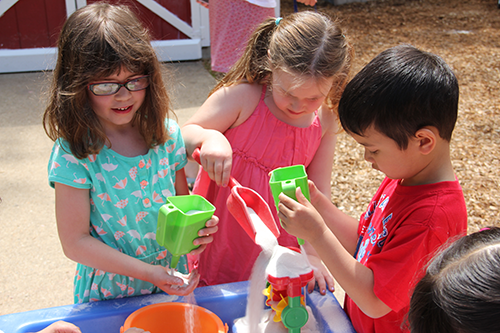 Dulin Preschool’s curriculum is designed to promote a child’s social, emotional, physical, and intellectual growth and development using a play-based curriculum. Our curriculum is not a body of knowledge that a child must acquire, but rather a body of experiences that will promote the child’s total development. Increasing a child’s ability to follow directions, handle transitions, and listen in a sustained manner. Developing a child’s self-confidence and ability to share and work cooperatively. Helping a child find acceptable outlets for emotions. Providing learning at a child’s individual level. Building on skills successively; for example, using manipulatives in order to strengthen hand muscles in preparation for drawing and writing. Children regularly engage in center-based activities which may include art projects, blocks, puzzles, math games, science exploration and dramatic play, as well as whole group time with books, conversation and songs, and outdoor or “rainy-day room” play. Our OWLS, FROGS & FOXES take several field trips throughout the year, which may include a pumpkin patch, holiday concerts, nature centers, and a pizza parlor! Note: Dulin Cooperative Preschool is a ministry of Dulin United Methodist Church. While Dulin Preschool families are invited to participate in church events, Dulin Preschool has no religious component or curriculum. We welcome all religious and cultural traditions, and our curriculum introduces our students to a variety of holidays and cultural events. The primary goals for our two-year-olds are to accept adults other than their parents as helpers, and to learn to be happy in a group of peers. Being a part of a group, they begin to learn more about the rights of others, the concept of taking turns, sharing, and how to transition between activities without becoming upset. Growing communication skills are encouraged to promote change in play patterns from parallel to cooperative play. Newly developed language and motor skills become tools for unlimited creativity. The major goals of the three-year-old classes are to begin to master their new skills; their more sophisticated dexterity and strength allow for more involved games and use of materials, and they begin using language to express their needs, settle disputes, and explain their ideas. 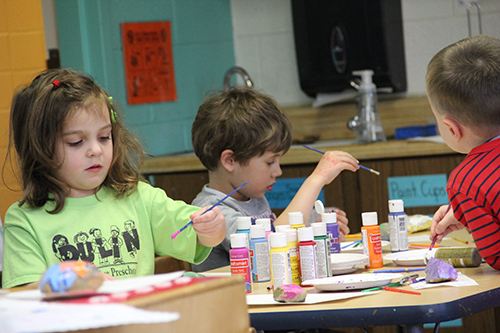 Academic skills are beginning to be acquired through developmentally-appropriate games, art, music and imagination. As these energetic children develop their ability to focus their energy, they are helped to master increasingly complex skills, from managing their own clothing with great pride to designing, drawing, painting and cutting their own project. There is great interest in new worlds, rhymes, silly songs, numbers, letters, pantomime and active group games. The major goals of our four- year-old classes are to increase attention span and self-control, to embrace the concept of sharing and tolerance for the needs of others, and to foster the emergence of abstract thinking. While hands-on experiences continue to be their major method for learning, more involved stories and quiet group participation are introduced. Dulin’s Enrichment program introduces important elements, such as a longer day, communal eating, a higher demand for self-regulation and larger class size, that are instrumental in preparing children for kindergarten. The program is designed to make the most of children’s curiosity. By exploring, discovering and experimenting, we will encourage early STEM skills and expand horizons. The program also will also stress early-literacy skills and a love of reading through a carefully curated selection of books, as well as reading comprehension discussions and story-writing. Cognitive skills – Children feel, take apart, drop and experiment with objects and things in their world to learn texture, weight, volume, size, shape and other concepts. Symbolic skills – When children play, they may use a block to represent a train, or a piece of paper to symbolize money. This power to symbolize leads to learning to use the symbols of letters, words and numerals. Problem-solving skills – As children play, they are constantly faced with problems. For example when they play house, they have to figure out how to take on certain roles. Writing skills – When children scribble and create symbols to represent a person or house, they are practicing all of the strokes they’ll need to write letters. 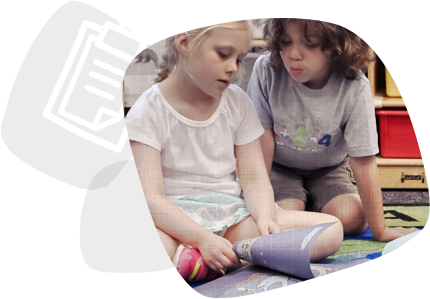 Reading skills – Children need a store of knowledge and understanding about the world in which they live before they can read. Children learn new words and their meanings through role play as store clerks, parents, or firefighters. Social skills – Play gives children the opportunity to learn, cooperate, share and negotiate. Children learn to be a participating, responsible member of the small democracy of their classroom. Emotional skills – Through play, children learn to express strong emotions in safe ways and develop empathy for others. Self-esteem is fostered as children gain control over their emotions.